What is the Fatherhood Support Network (FSN)? The Fatherhood Support Network is an IRS recognized 501(c)(3) non-profit organization whose mission is to help fathers maintain an active role in the lives of their children and to significantly reduce the number of children growing up in father absent homes. As a solution-focused organization, our primary objective is to train Fatherhood Mentors across the country to provide one-on-one mentoring to fathers in need of support, encouragement and guidance. Additionally, we organize, promote, and participate in father and family-focused community events such as our annual pledge drive “Bowling for Dads” on Father’s Day (www.BowlingforDads.com) and “Dad’s Night Out” (our annual fundraising event held in Las Vegas, Nevada in April). These events help shift society’s attention to recognizing, supporting, honoring, and celebrating with dads who are consistently available, and fully committed to maintaining an active role in the lives of their children. 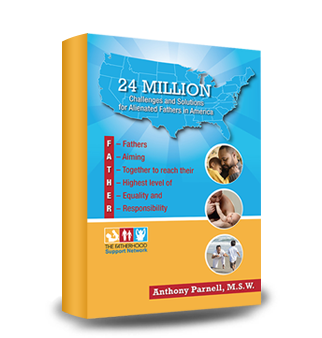 While there are economic and political factors that greatly contribute to the epidemic of absent fathers in America, The Fatherhood Support Network believes that by creating a network of men supporting other men fewer fathers will abandon their children. Thus, our primary objective is to PROVIDE TRAINING for men to provide one-on-one mentorship to fathers in need of support, encouragement, and guidance. We have already partnered with the Las Vegas Urban League having provided training to ten of their employees to utilize our mentorship model in their work with fathers in the local community. The Fatherhood Support Network has also published a book on the epidemic of absent fathers in America entitled “24 Million: Challenges and Solutions for Alienated Fathers in America.” It provides biographical testimonies of “alienated fathers” who have overcome challenges and adversity to maintaining an active role in the lives of their children and offers solutions for addressing the epidemic of absent fathers in America. Train 1, 000 Fatherhood Mentors across the United States to provide mentorship to fathers in need of support, encouragement, and guidance. Provide direct financial support to 1,000 fathers to assist in their ability to build and maintain an active and consistent relationship with their children. Host family events and activities such as “Dad’s Night Out” and “Bowling for Dads” on Father’s Day for the purpose of providing an opportunity for more than 1,000 fathers to engage in a positive family activity with their child/children. Build a Network of Mentors in each of the 50 states whereby fathers in need of support, encouragement, and guidance have access to a Fatherhood Mentor in their home state. Establish collaborative partnerships with a minimum of ten national and international organizations who are committed to significantly reducing the number of children in America (and globally) who live in father absent homes (currently 24 million in the United States).